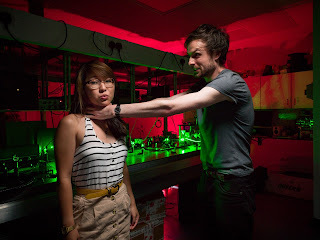 The Quantum Workshop is my secondary science-love-project which I run with Dr. James Millen, or 'Jams' as he is more affectionately known as (probably only by me). 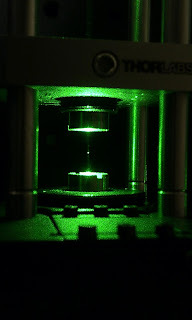 It currently consists of a perspex box that houses a 2W green (532nm) laser which is levitating dust and ash particles. What makes this super awesome is that you can visibly see the particles levitating. Since March 2012 we've been to science festivals all over the UK including the Oxfordshire, Cheltenham and BA flavoured ones. 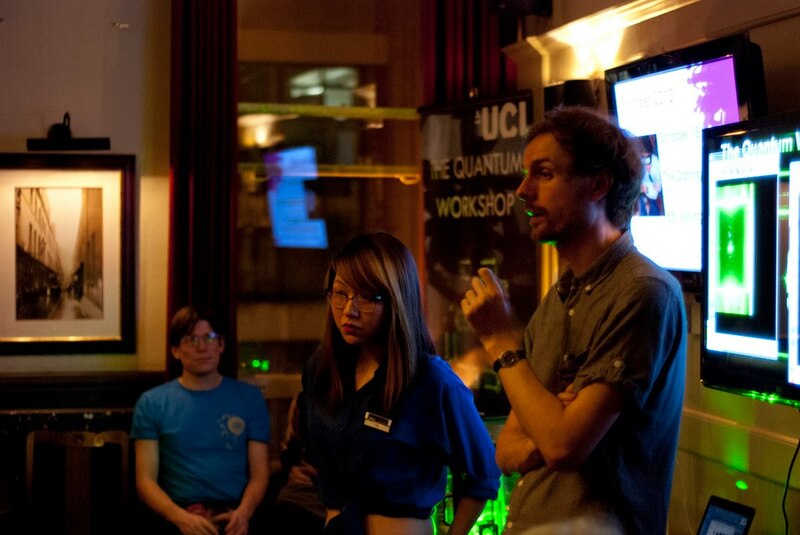 We've also done talks in some unique locations such as for the Pervasive Media Studio in Bristol, Spitalfields Market and The Lamb Pub [featured as the hot event in The New Statesman]. I'm going on a long journey with this and I'd like you all to hop aboard. 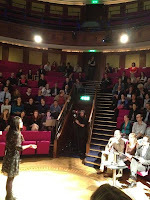 Anyway, here is a photo of me talking, excuse camera phone quality. At least it's not instagrammed. 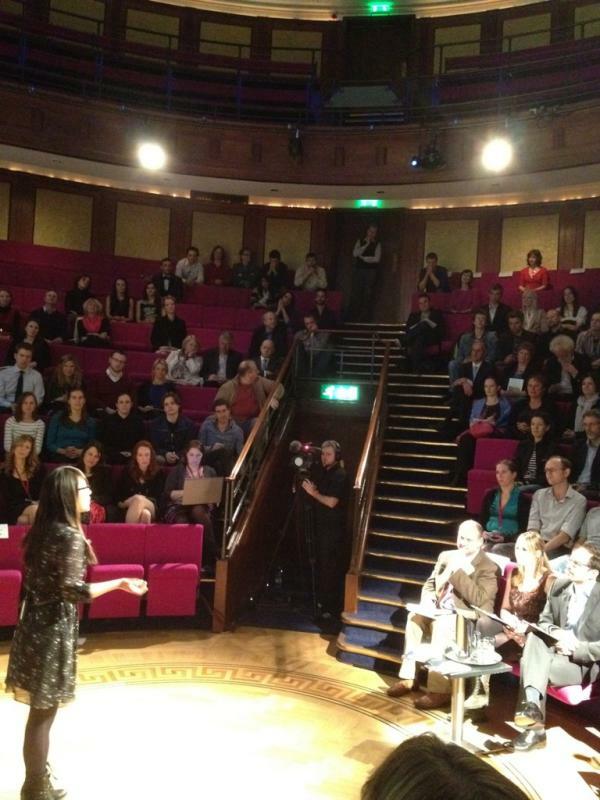 I entered the video heat of FameLab 2011/12 at the end of last year and I WON! The concept is: 3 mins to explain a complex scientific concept. No powerpoint! The other entries were super so I was very shocked and surprised to be a finalist. Famelab is a great event aimed at finding the next generation of science communicators, with prizes along the way. It's international as well so check out entries from all over the world. The UK Final will be held at the Royal Institution in March so I have some time to think of a new subject...and obviously some props! Essentially I'm explaining Young's Double Slit experiment. 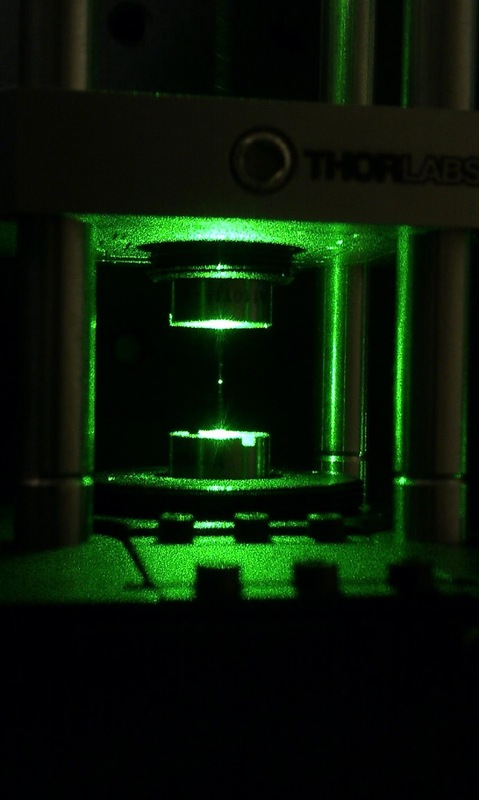 It's the greatest and bestest quantum physics demonstration we have. And you can derive nearly all of the theories of quantum mechanics from it. Although I don't think Young expected me to explain it using Justin Bieber though. I did a talk based on my blog post 'Stop asking for a lightsaber' at a brilliant event called Ignite which is TED based in nature but with added rules. 5 mins, 20 slides timed at 15s each...POWERPOINT 2003. It's a lot of nervous fun and the audience are always supportive...even when you try and include poo jokes.